The new-generation Tide Class tankers are being built by Daewoo Shipbuilding and Marine Engineering. Each MARS tanker has three replenishment at sea (RAS) stations. SeaQuest Marine Project Management Ltd. The Tide Class tankers are equipped with Kelvin Hughes’ SharpEye radars. Image courtesy of Kelvin Hughes Limited. Tide Class is a new fleet of four tankers being built to enhance the Royal Navy’s maritime capabilities. The first vessel in the class is due to be commissioned into the Royal Fleet Auxiliary (RFA) service in 2016. The next-generation tankers are part of the Military Afloat Reach and Sustainability (MARS) project and are intended to replace the RFA’s ageing fleet of single-hulled tankers. The vessels are designed by BMT Defence Services, in co-operation with BMT Reliability Consultants and BMT Isis, based on AEGIR tanker. The prime contractor Daewoo Shipbuilding and Marine Engineering (DSME) will oversee the construction of the vessels at its yard in South Korea. The Tide Class vessels are intended to provide logistics support and services such as transportation of fuel, fresh water, food, and weaponry to the Royal Navy’s warships and vessels deployed across the world. In addition to maintaining the Royal Navy’s bulk fuel replenishment at sea capabilities, the tankers can also conduct constabulary and humanitarian aid missions, as well as provide assistance to NATO and coalition allied forces. DSME was selected as the preferred bidder for the MARS tanker project in February 2012. The UK Ministry of Defence (MOD) awarded a £452m ($715.8m) contract to DSME in March 2012, to construct four MARS tankers for the RFA. In April 2012, BMT Defence Services, a subsidiary of BMT Group, was selected to provide design services for the Tide Class tankers under a subcontract with DSME. The lead vessel in the class, Tidespring, was laid down in December 2014 and launched in April 2015. It will undergo outfitting and capability trials at A&P Group in Falmouth, UK, prior to commissioning. The second vessel, Tiderace, was laid down in June 2015 and launched in November 2015. Keel for the third vessel in the class, Tidesurge, was laid in December 2015 and its launching ceremony took place in March 2015. First steel for Tideforce, the last vessel in the class, was cut in December 2015. The Tide Class is fitted with double hulls to help reduce or prevent oil spills. Its design incorporates commercial off-the-shelf components to achieve lower life-cycle costs. The ship has a length of 200.9m, a beam of 28.6m, a draught of 10m, and a displacement of 37,000t. It can accommodate up to 63 crew members and 46 embarked personnel. The tanker features a fully-equipped hangar and a flight deck to support the operations of a medium-sized helicopter. It also has three abeam replenishment at sea (RAS) stations for fresh water, aviation fuel and diesel oil. Communications systems onboard the Tide Class include Selex ES’ communications management system, identification friend-or-foe (IFF) solution with MPS2000 system, topside electromagnetic modelling, tactical data links, HF, VHF and UHF radio systems, and a range of audio visual recreational systems. The communications management system provides a centralised control of all communication systems aboard the tanker. The Tide Class also features Kelvin Hughes’ integrated bridge system, three SharpEye radar sensors, Naval MantaDigital (NMD) displays, and navigation sensors. Powered by a hybrid propulsion system, which combines electric motor and diesel engine or gas turbine, the tankers offer high fuel efficiency and emit lower carbon dioxide. "The Tide Class vessels are intended to provide logistics support and services such as transportation of fuel, fresh water, food, and weaponry to the Royal Navy’s warships and vessels deployed across the world." Selex ES, a Finmeccanica company, was selected by DSME to provide a wide range of communication equipment to help ensure safe operation of the new Tide Class tankers. Ships Electronic Services (SES) was contracted by Selex ES to supply VINGTOR’s EXIGO Public Address and General Alarm (PA/GA) system, developed by Zenitel. Kelvin Hughes Surveillance received a contract in September 2012 to deliver integrated bridge systems (IBS), navigation suite, command and control system, and helicopter control radars. A contract was awarded to GE Power Conversion to supply electric drive systems for the Tide Class fleet in October 2012. In April 2013, DESMI won a contract to provide pumping system packages for the tankers. 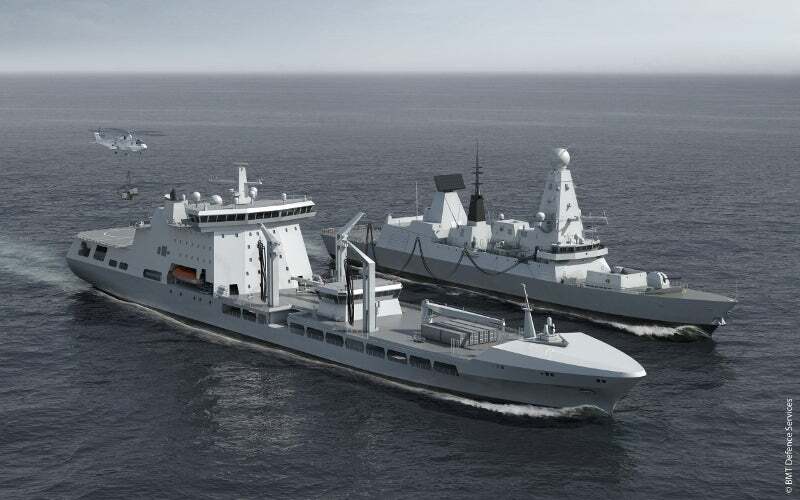 The UK MOD’s Defence Equipment and Support (DE&S) division awarded a contract to SeaQuest to provide supervisory services for the MARS tanker project in 2013. In January 2014, Servowatch Systems was selected by DSME to supply Integrated Platform Management System (IPMS) for the MARS tankers. In January 2015, the UK MOD awarded a contract to A&P Group to provide outfitting and support services for four MARS tankers. Enterprise, infrastructure, buildability and through-life support are central to BMT's submarine design and support services. Using a systems engineering approach to whole ship design, experts at BMT have developed a multi-functional warship design that balances buildability, survivability and performance for maximum through-life platform effectiveness and value for money.